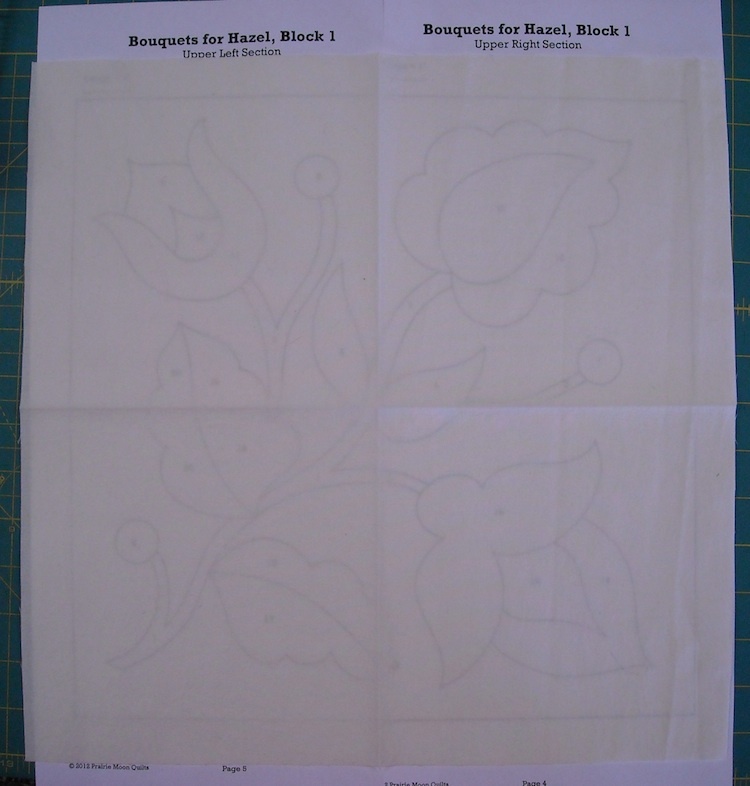 Otherwise known as prepping your pattern and your background fabric for applique. That’s what we’re doing today . . .
Oh, but before I start . . . Damon, Dale’s brother, is having open-heart bypass surgery today. So if you’re the prayin’ sort, send up a few for him . . . for everything to go well, and for a complete and speedy recovery. Thanks! You need a pattern, don’t you? The link should work from here, but if not, you can also get it from the “Life of Hazel Ilene” web page on my regular web site. I’ve put a link to that page in the sidebar under “Favorite Links”. 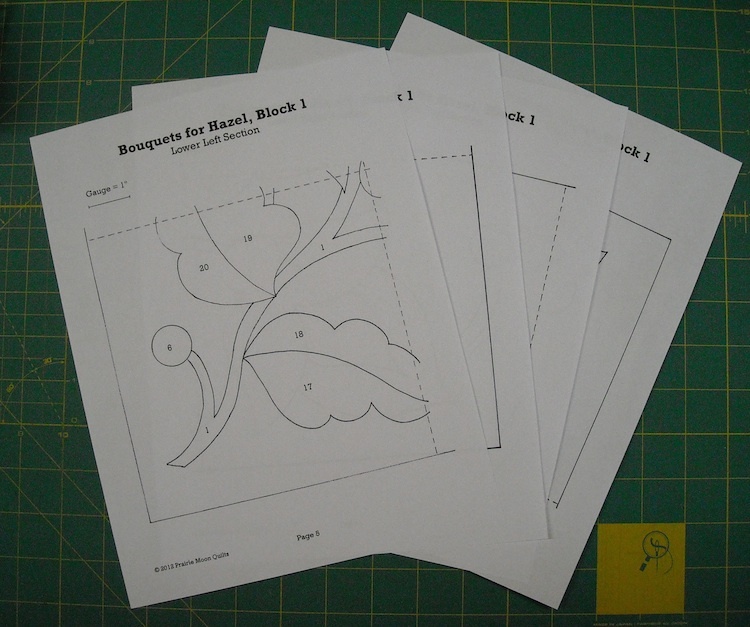 Once you have it downloaded, print out the four pages of the applique pattern. 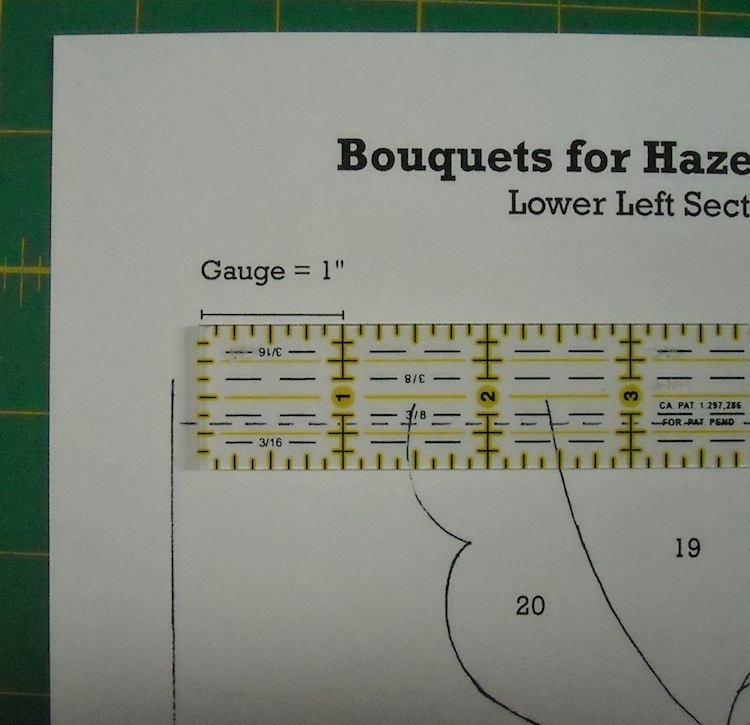 Then check the gauge to make sure that the pattern printed out the correct size. It should measure exactly 1″. If it’s off, you need adjust your print size accordingly to get it right before you start. 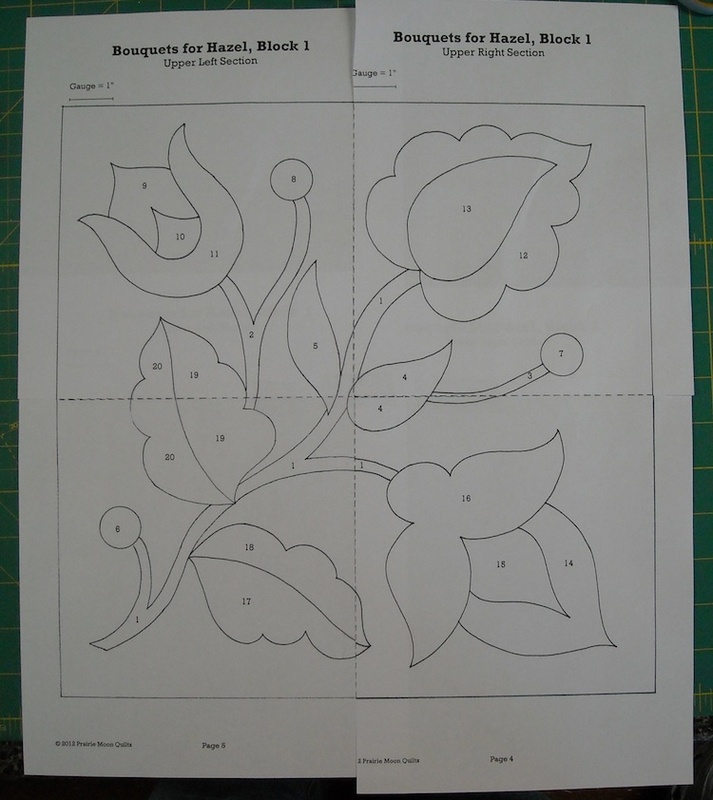 Next, you’ll need to tape the sections together to make the full-sized pattern. I usually trim off the edge of one of the overlapping parts on the dotted line, so I can see to line things up correctly. Line them up, and tape them together. Repeat for the top two sections . . . and trim the top half along the dotted line. 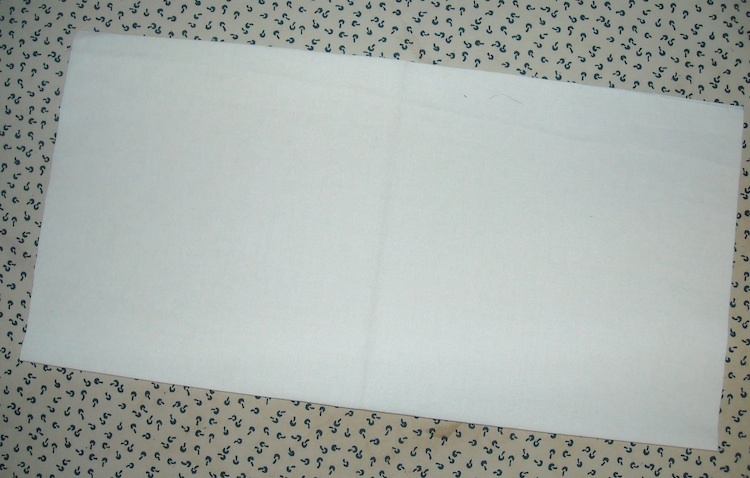 Then line it up on top of the bottom half, and tape the halves together, and your full-sized pattern is ready to go. You haven’t lost your background block you set aside yesterday, have you? Good, ’cause that’s what you’ll need next. 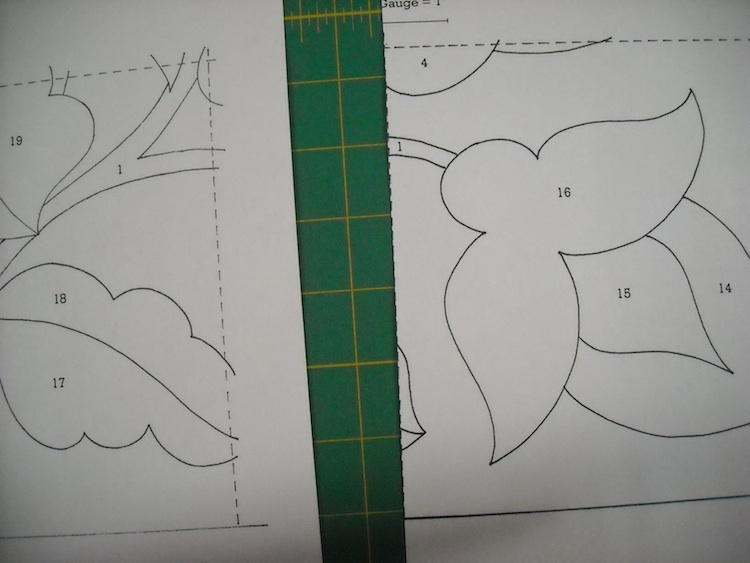 To prepare the background fabric for applique, fold it in half and press a crease in the fold. Fold it in half the opposite way and press another crease. You should have creases dividing your background square into 4 equal sections. Position your fabric over the paper pattern, lining up the creases in the fabric with the dotted lines on the paper pattern. Tape this all in place so it won’t move, if you need to. 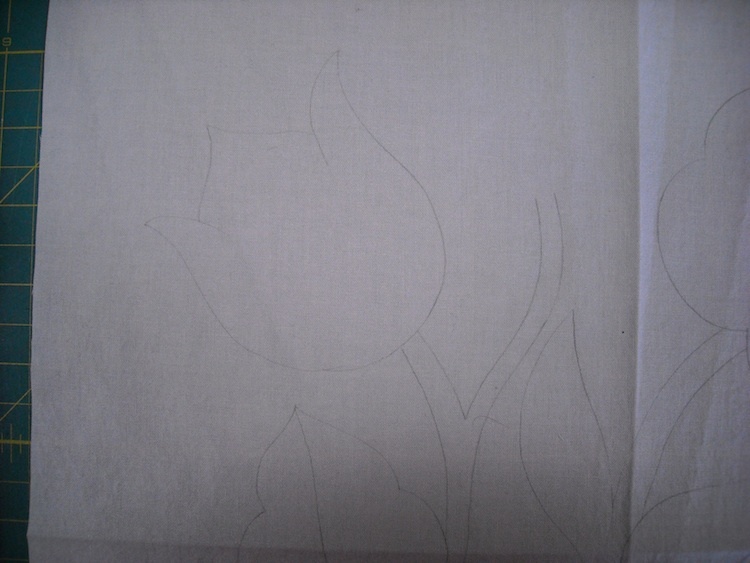 Now, using a marking pencil that will either wash or press out, trace the design lightly onto your background fabric. You do not need to trace the insides of flowers, as they will be covered up by the first piece of fabric you put on anyway. See how I just did the outline and not the middle part? 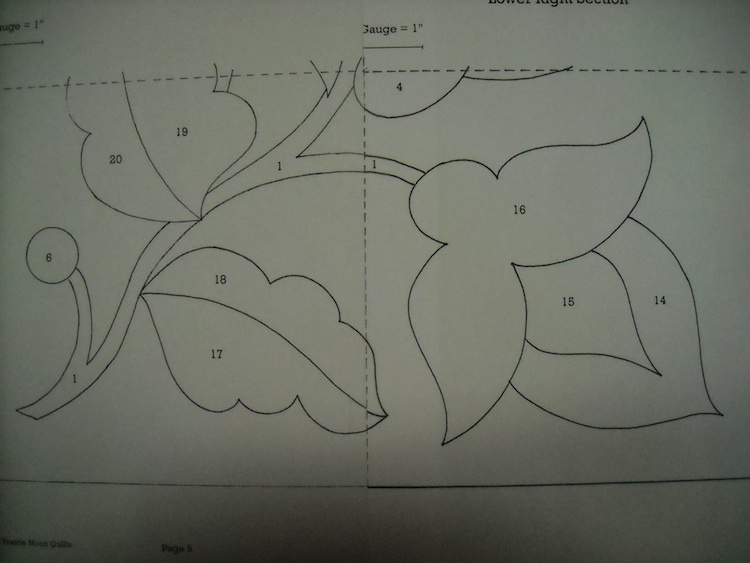 I also did not trace the little “berry circles”. 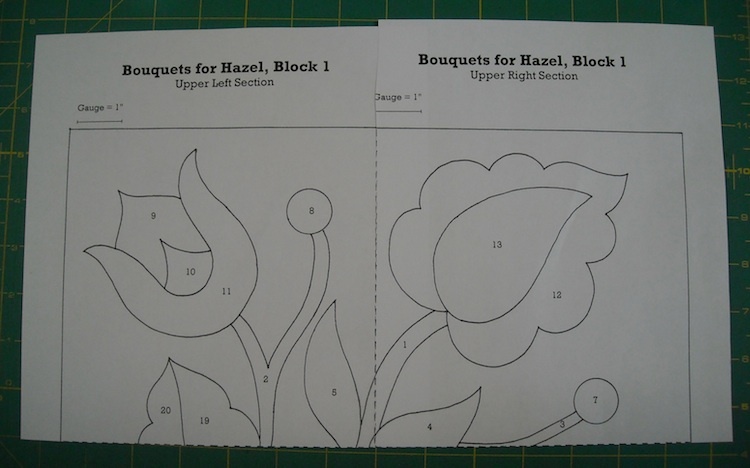 Once you get the stems in place, it will be obvious where they go, so there’s no need to mark them. Saves you time and effort this way! Mark only as dark as you need to in order to see the design. 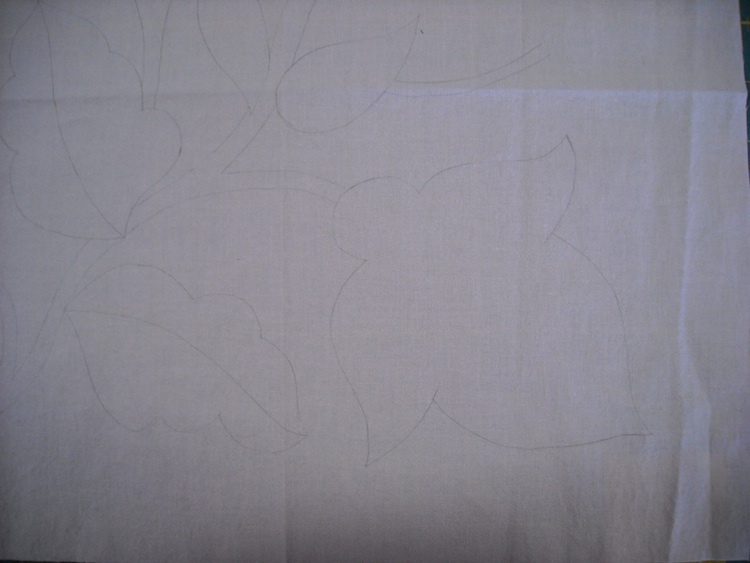 Be careful not to pull or stretch your fabric as you trace. If your fabric is too dark to see through to trace the pattern, you can use a light box, or tape the pattern to a window, so that the pattern will show through the fabric so you can see to trace it. And you’re all done with that step! Not too hard so far, is it? I was going to talk about templates today, but I’ve decided to save that for tomorrow, since I’ve spent enough time writing today. 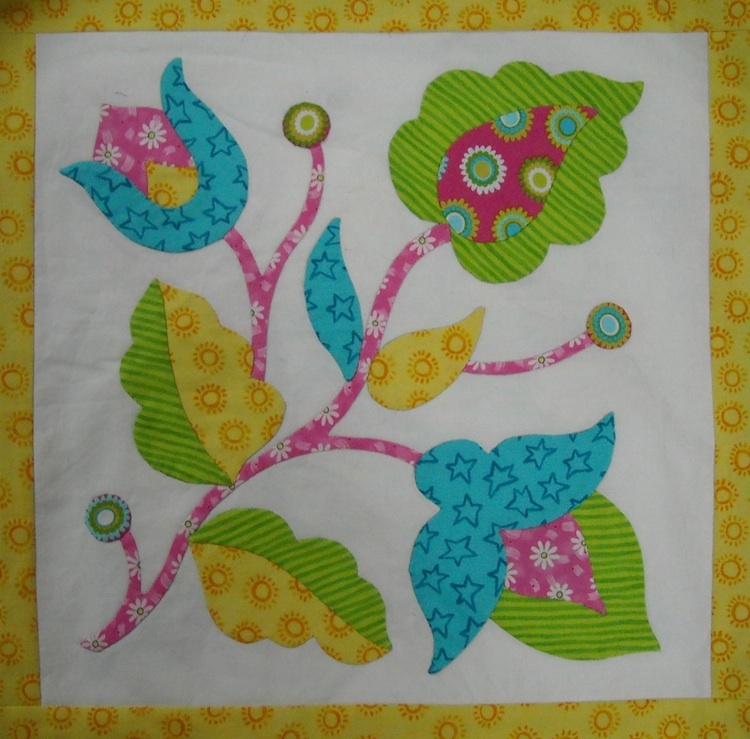 I feel the urge to go quilt something, so I’ll be back tomorrow with the next steps. Just checking in to see how Damon’s doing today. Daily prayers for all to go well and a speedy recovery. I’m not getting to make this quilt at the moment, but I’m following along and using your tutorial for the Mare-y Christmas wall hanging. Hangin my head that I didn’t get it done before Christmas, but on the bright side…they’ll be great gifts for my ranch wife friends this year!